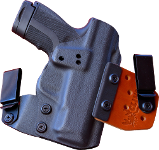 The Smith & Wesson Military & Police Bodyguard .380ACP is a small firearm that packs a big punch and looks great in our S&W M&P Bodyguard 380 concealed carry holsters. The Bodyguard 380 is a single-stack, double-action, semi-automatic pistol that competes directly with the Ruger LCP, Taurus TCP, Beretta Pico and maybe a couple more mouse guns. The Bodyguard is 5.25″ long, 3.75″ tall, and nine-tenths of an inch wide. Making this a brilliant choice for pocket carry. There is a manual safety, slide stop, and steel sights, not found on some of the mouse gun competition. The Bodyguard is a masterpiece in ergonomics. The textured grip and magazine release prevents the weapon from shaking out of your hand. There are two (2) distinct finger grooves on the pistol grip and your little finger can rest beneath the magazine. If you have the extended magazine, you can have a full three (3) finger grip. Okay, so this gun is the size of a modern smartphone, maybe even smaller, you would expect it to have a killer recoil, right? Nope. In fact… the recoil is very tolerable on this tiny pistol. It’s very impressive. Due to the locked out breech and rapid reset of the DAO trigger, there is less recoil than you’d expect. It is so minimal that it should not hinder you squeezing your next round off seamlessly. For a gun that is barely bigger than a standard deck of cards, the M&P Bodyguard 380 is controllable, accurate and completely reliable, and for a personal defense carry weapon, that’s exactly what you need. 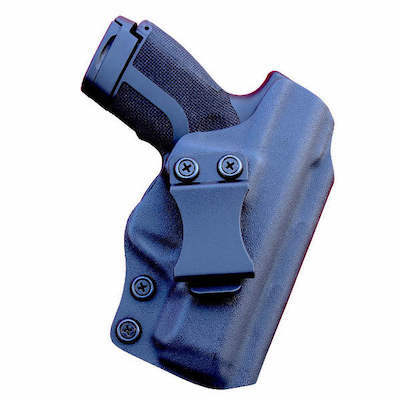 Once you get a good S&W M&P Bodyguard 380 Kydex holster, you’ll be all set to Conceal Carry.